Weird Wonderful Web: Need help fooling random drug tests? Urine Luck - A chemical detoxifying agent to fool random drug tests. So, DO you need help fooling the random drugs tester? Well guess what? You're in luck with Urine Luck (hehe, you see what they did there?). 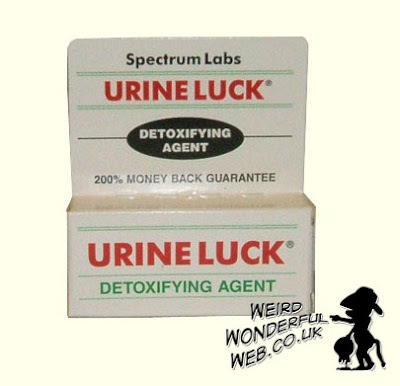 The ever helpful chaps at Spectrum Labs have developed a detoxifying agent called Urine Luck. A chemical agent that you simply add to your urine sample during a random drug test. You get two vials. And according to the website "Each vial is the size of a human pinkie finger." So you should be able to manage this with a little slight of hand. And in case you haven't noticed - it says "200% MONEY BACK GUARANTEE" on the box!